Sa’anapu with support from the Samoa Touch Rugby Incorporated hosted a one day “Touch 4 Awareness Tournament” recently at the Sa’anapu Primary School fields. As one of the first tournaments hosted in the rural areas this year, the mix tournament was a great success in providing exposure for the sport of touch rugby in Sa’anapu, with 11 teams competing for the title. After pool games, the Bladerunners, Marist Family, Stay Aloof and No Idea advanced to the semi-finals. Both semi-finals were thrilling matches, with No Idea and Bladerunners overcoming their opponents to book a place in the Final. The Cup final was a great match and with both teams displaying great speed and talent during the match, Bladerunners secured the “Sa’anapu Touch 4 Awareness Tournament” title beating No Idea 3-1. During the prizegiving, the awards were presented by Mailata Michael Wulf (Samoa Touch Rugby Incorporated President) and Lea’ana Fesilafa’i (Principal of Sa’anapu Primary School) and Lea’ana Tuaniu (Saanapu representative). 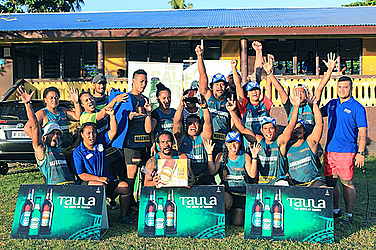 The ‘Touch 4 Awareness’ tournament organizers would like to acknowledge the Samoa Touch Rugby Inc, the village of Saanapu, Sa’anapu Primary school, major sponsor Taula Beverages and the collaboration with Samoa Family Health Association. We would also like to acknowledge all participating teams – USP, Ana o Seuao, Family One, Latatuli, Lets Bake Touch, the Untouchables, Nofo Swifterz, Marist Family, Stay Aloof, No Idea and Bladerunners.